Fashioning the Body: An Intimate History of the Silhouette examines the extraordinary ways in which women and men have shaped their bodies into distinctive silhouettes in the name of fashion. Having garnered high acclaim at the Musée des Arts décoratifs in Paris in 2013, the exhibition Fashioning the Body will present the many devices and materials that women and men have used to shape their silhouettes from the seventeenth century to today, including panniers, corsets, crinolines, bustles, stomach belts, girdles, and push-up brassieres, alongside examples of period garments that were molded by these distinctive understructures. The exhibition will also look at how lacing, hinges, straps, springs, and stretch fabrics have been used to alter natural body forms. 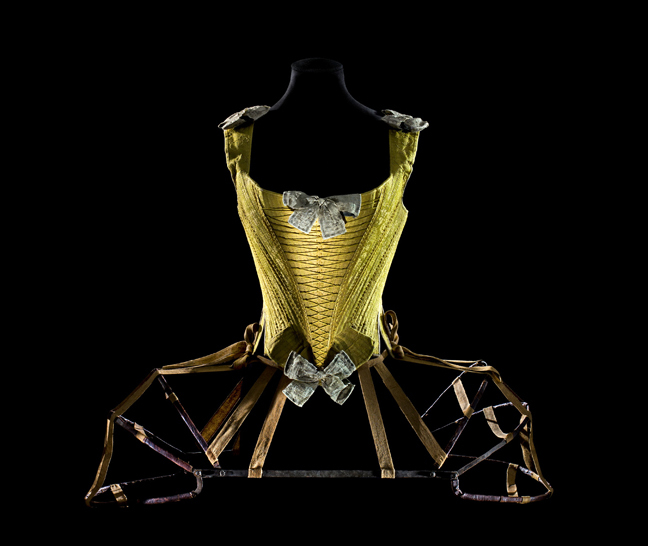 Curated by Denis Bruna, Curator of Costume and Textiles at the Musée des Arts décoratifs, the exhibition will explore the history of what has long been “behind the scenes” in clothing and fashion – far beyond the corset, the best-known device for shaping the figure. This show, which draws heavily on the Paris museum’s unrivaled costume collection, is the first of its kind, and the Bard Graduate Center will be its only venue in North America. In addition to complete outfits shaped by these hidden structural contraptions, the exhibition will also feature moving mannequins wearing mechanized reconstructions of panniers, crinolines, and bustles in order to show how the undergarments worked.